3 foods you should NEVER eat! If you enjoy breakfast or lunch on-the-go, I understand. Our lives are so busy; we don’t always have time to cook. But beware: Some “convenience foods” simply aren’t worth it. You’ll pay for it with added inches to your waistline. And even worse, those excess pounds lead to chronic and deadly diseases including obesity, cancer and heart disease. 3 foods your should NEVER eat! Below are three foods that will put you on the fast track to fat AND sick. This one usually shocks people. After all no one thinks of cereal as being a threat to their health. But the truth is no matter which one you choose, breakfast cereals are high on the glycemic index (GI). For many people, a dose of high-glycemic carbs in the morning is like a prescription for building excess body fat. You’d almost be better off eating a candy bar or a piece of cake! The GI of an average piece of chocolate cake is between 31 and 38… a Snickers candy bar is about 43. Not bad. Compare that to the GI of Kellogg’s Corn Flakes…which registers a whopping 132. That means corn flakes break down into sugar in your bloodstream faster than pure glucose! And if you add fuel to the fire by putting sugar on your cereal, you’re sending an overwhelming surge of sugar into your system. Remember, high blood sugar triggers a wave of insulin. And insulin is the hormone that sends the message to build and store fat. Even so-called “healthy” cereals like Grape-Nuts have a GI of 80. That’s also very high. It might be a fast fix when you’re rushing in the morning, but cereal in the morning will make you fat. Avoid it at all costs. 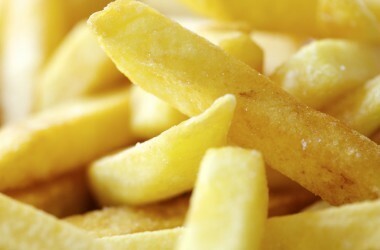 French fries are quite possibly the worst foods you can eat. First off, potatoes are high-glycemic and not good for you in ANY form. But when you take potatoes and deep-fry them in trans fatty oil, you have a recipe for sickness and disease. While white potatoes aren’t the best choice, the oil they’re cooked in adds much more danger than the potatoes do. If you need a potato fix now and then, opt for a baked potato or, better yet, sweet potatoes. They’re loaded with carotenoids, vitamin C, potassium, and fiber. Don’t fall for the “whole-grain goodness” trap. When it comes to the glycemic index, it matters very little whether breads are made from whole grain or not. Grains spike your blood sugar, and you know what that means. Forget about the commercials you see on TV. Unless you’re very poor and can’t get enough calories without them, you should avoid grains at least until you get as lean as you want to be. You’ll be better off without them. In the morning, take a few extra moments and scramble some eggs. Before you throw the eggs in, saute some sliced tomatoes and spinach. Maybe some onion, too. In less than 10 minutes, you can have a delicious breakfast that will make you feel pumped and energetic for the whole morning. for the acid reflux, get off all grains, dairy and foods that are allergenic, that helped me. once the stomach is settled it seems to start to heal, take lemon juice in warm water first thing and this stimulates digestion but also leaves an alkaline residue. start juicing regularly, cabbage juice is brilliant for ulcers etc. perhaps some soothing herbs for the throat blisters, marshmallow etc. reflux would be contributing. what has caused them? I agree with this, ESPECIALLY the breakfast cereal part. I have to tell you that if I eat cereal in the morning, especially any sugar-laden cereal, I feel sick all day long. Even though I am not overweight, I still want to stay the right weight for my height, and so I do watch what I eat. If I eat eggs or even just a quick glass of milk (raw milk with tons of nutrients, nutrition and protein) in the morning, then my day is filled faster. For hot cereal, I do like cracked wheat, and organic versions of cream of wheat. I use raw milk, along with raw butter and Stevia to sweeten them up. Stevia doesn’t affect the GI. Cold cereals are a joke. I have granola in my house because we like to put it on yogurt, but other than that, only when guests come over to stay for a visit do I have cold cereal (I do realize that when I host people, I should try to provide things that they would like to eat… just because we don’t drink soda pop doesn’t mean I can’t be a good host and have some for them! Same with cereal, white bread – yuck, and “snacks” for their kids). Recently I watched my friends 3 children for the weekend, and purchased food from what their mom said that they eat regularly. I think the healthiest food on the list was mac and cheese, and we know how unhealthy that is! I kept trying to get them to eat carrot sticks, or even a piece of fruit! Oh well. There are healthy organic cereals, without nothing artificial, just organic good stuff. One of them is Natures Path. All their creals are organic and some are gluten free. There is another type of cereals, Musli. These are mix of nuts, seed and oats. NaturesPath makes them as well, but the best ones are by Bobs Red Mill and Dorset(from UK). Dorset is organic and really very very good, with good amout of brazil nuts and large raisins. NaturesPath is generally not sold in regular supermarkets, maybe in some, and also 2-3 types, less popular. Whole Foods carry a lot of them. Dorset, the same thing. So, those who are still keep buying these old nasty cereals from kraft, kellogs and other food mafias, STOP it! Another advise, instead of useless pasteurized “milk”, use rice milk or hemp milk in cereals. It will make a big difference. Since we need more fiber in our diet, why eliminate good sources? Multigrain and whole grain breads have 48 and 50 scores. There are good choices out there; it would be better to provide us with good options than incorrect information. What are the causes and preventions of acid reflux. I have a friend with acid reflux and blisters on her vocal chords, and may need an operation that may damage them. Is there a cure for those blisters? Would preventing acid reflux lead to natural healing of those blisters? Great list but I would say that cow’s milk in any liquid form ranks right up there with these three. I can’t believe Bread is one of them I got to tell my sister because she always eats bread thank you HEALTHIERTALK! i have read that “whole grain” anything is bad as it makes u fat. are Oats considered a “whole grain” – oats come from Barley and barley is a grain….. I wonder if i never knew this stuff. or if it is fake. but good thing i never eat cereal or french fries! Bread is NOT bad for you. Eating too much bread or any bread made with processed flour is bad for you, but so is eating too much of anything or any food made with processed ingredients. Don’t get on the glycemic index bandwagon, which is going to lead you to a daily diet of diet foods. Eat whole foods, including grains and yes, even breads, but eat them in the right proportions and portion sizes. If bread was unhealthy we would have figured this out thousands of years ago and stopped going through all of the trouble of cultivating grains to grind into flour and bake into bread. The USDA pyramid is wrong on the daily servings of grains but it is correct on including them in our daily diet. Think and eat sensibly, and when you read about how whole foods have been discovered to bad for you don’t believe the hype. This is kinda crazy, which means I don’t care much. Acid reflux is most of the time caused by too little stomach acid so the food you eat is not digested. But before you add Betaine hydrochloric acid to your diet you need to heal the stomach in case you have gastritis. Juice cabbage, alove vrea barbadensis or buy it from the health food store. Biotic’s has two products I highly recommend called Gastra Zyme take one to each meal and keep increasing till stool turns purple and HPF 1-2 three times daily. Take for at least 21 days. Now you can try Betaine HCL. Avoid coffee, alcohol, sugar, refined carbohydrates, cakes, etc. Don’t mix starches with protein. Drink very little before a meal. Don’t drink with a straw. Keep you stress level down. My Lord, this article is full of naked assertions and unsubstantiated woo. It was painful to read. Look at all of these crazy comments. What is this, an invasion of the pro-grain propaganda police? well my mom bakes homeade bread! and homeade granola! it’s the storebought bread and granola you don’t want. This link may help explain some of the reasons that bread is unhealthy. This link is to the wiki entry about the Glycemic Index. It is helpful to understand what it is before ruling out its importance to our health. I know from experience when I eat high GI foods I am burnt out faster and hungrier all the time therefore I eat way more than I should. Low GI foods make me feel good, I eat less overall and feel better overall so therefore I am also more productive and more active. The GI thing is not a “band wagon” to be jumped on or not. It is simply information that you can choose to pay attention to or not. But does learning about it and experimenting with it for yourself to form your own informed opinion really hurt? Or would you rather pass it off as the latest fad diet without really knowing a thing about it? I say this because many comments here seem to come from people who haven’t bothered to learn about it for themselves. ‘Look at all of these crazy comments. What is this, an invasion of the pro-grain propaganda police?’ — no, but when you make a bold statement like “never eat!” people look at that closely. I think there’s some truth to it, but moderation is key.